Fruiting body 4.0-7.0 cm broad, globose to slightly compressed, lacking a sterile base, attached to the substrate via a white mycelial cord; peridium thin, <1.0 mm thick; exoperidium white, glabrous to matted-tomentose, becoming dingy-tan, occasionally squamulose to areolate, eventually dark-brown to mahogany-brown; exoperidium persistent, often present at maturity, gradually peeling away, absent only in weathered material; endoperidum metallic-grey, sometimes patchy bronze-brown to purple-brown where overlain with remnants of exoperidium; gleba white, turning olivaceous, then dark-brown to slightly purplish at maturity, texture firm; spores released via apical cracks and tears; sterile base and subgleba absent; odor and taste mild. Spores 3.5-4.5 µm, globose, thick-walled, smooth to roughened, often with a central oil droplet, some with a clear, short pedicel, usually <1.0 µm, rarely up to 3.0 µ spores dark-brown; capillitium bovistioid, composed of individual filaments, branching more or less dichotomously from a trunk-like base; pits absent. Solitary, scattered, to gregarious along trails, grassy areas, or in sandy soils under conifers like Monterey cypress (Cupressus macrocarpus); fruiting throughout the mushroom season. Edible when young and the gleba still white. 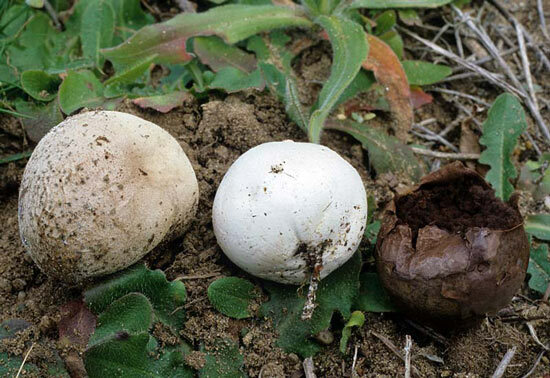 The principle fieldmark of this common puffball is a metallic-tint of the mature fruiting body. The release of spores via an apical tear or rupture is suggestive of Calvatia species, but these differ in the color of the endoperidium and the type of capillitium. Closely related Bovista plumbea is differentiated by smaller size, spore release from an apical pore, and attachment to the substrate via a tuft of mycelium as opposed to a mycelial cord (best seen in young material). The two species are also distinct microscopically, Bovista pila, having smaller, round spores with a small pedicel, as opposed to oval spores with a long, 8-11 micron pedicel.